SAEM students pictured at the Country Music Hall of Fame left to right are Elizabeth Cook, Amber Flevaris, Madison Lescallette, Nicolette Jones (in front), Emily Kern, Rachel Travisano and SAEM alumna Samantha Lynn. Six students in the sports, arts and entertainment management program were chosen as volunteers for the 2015 Pollstar Live! Music Conference in Nashville where they networked with leading professionals in the music industry Feb. 18-22. 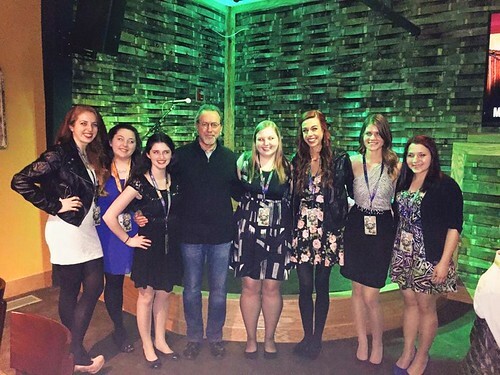 "The Pollstar Music Conference is a terrific experience for our students. Not only do they get to volunteer at music's premier conference, but they also get to interact with some of the industry's biggest managers, booking agents, record execs and touring personnel. Our hope is that these face-to-face meetings provide the connections our students need to get them entry-level positions in the entertainment business," explained Associate SAEM Professor Ed Traversari, who accompanied the students on the trip. Since the Point Park SAEM students attended the conference as part of Pollstar's College Volunteer Program, their registration fees were waived. "Being able to meet and network with so many professionals in the music and events industry really benefited me as an SAEM student. It was amazing to be able to hear and see what we learn about venues, the recording industry and live entertainment put into action all over the world," said Amber Flevaris, a junior SAEM major. "Our industry is mostly about who you know and are connected to, and being able to meet as many people as possible can be of great assistance in getting jobs," added Madison Lescallette, senior SAEM student. Kelly Shaunnessy, production assistant and Jerry Fox, security director for Bruce Springsteen. In addition, the students toured William Morris Endeavor Entertainment, a talent and literary agency; engaged in a networking breakfast with speakers from SMG, Coachella Valley Music and Arts Festival and BRE Presents; attended the Pollstar Awards Party at the Ryman Auditorium, the most famous home of the Grand Ole Opry and went to an after-party at the New Nashville Winery. "Professor Traversari was able to set up a meeting for me with John Esposito, president and CEO of Warner Music Nashville. I am the college marketing representative for Warner Music Group in Pittsburgh, and John is my biggest role model," remarked Rachel Travisano, SAEM junior. "It was an amazing experience meeting with him, and I received so much great advice."